The UCPD arrested one of the protesters for trespassing. Update (12:23 a.m.): Diaz has been released, according to a Revolutionary Communist Party fundraising post shared by founding member Carl Dix. Campus police arrested a 28-year-old male unaffiliated with the University for trespassing Wednesday afternoon after he stood up on a table in Baker dining hall and protested for a communist revolution in the United States. “Since they did not comply, UCPD were called and one person was arrested for trespassing,” spokesperson Marielle Sainvilus said. Noche Diaz, the man who stood on the table, is facing misdemeanor charges, according to Chicago Police. A video of the scene taken by second-year Emily Shen after Diaz got down from the table shows an altercation between the protesters, the UCPD, and a student wearing a red shirt. The student appears to push a protester, who is not Diaz. Shortly after, the UCPD led the protesters out of Baker. Bright also told the Maroon that a female protester was hospitalized. Sainvilus’s comment did not mention a female sustaining injuries. “The fact that on a college campus, somebody can’t stand on a table in a cafeteria and shout out announcements about what the hell is going on in the world […] is outrageous,” Bright said. The student manual says that the University can deny public access to its property. Earlier in the day, the Revolutionary Communist Party protested a John Kerry talk in Mandel Hall hosted by the Institute of Politics. At around 1:30, the protesters were seen handing out flyers in front of the Regenstein Library. A Revolutionary Communist Party protesters holds up a sign that reads "America Was Never Great" outside a John Kerry talk in Mandel Hall. At 6:30 p.m. tomorrow, the Platypus Affiliated Society, an RSO for the “practical reconstitution of a Marxian Left,” is sponsoring an event in the basement of Stuart Hall titled “America was Never Great! 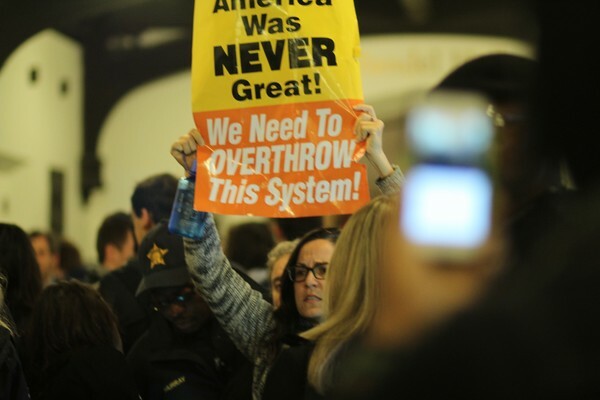 Overthrow–Don’t Vote For–This System!” with founding member Carl Dix. During their protests today, RCP members promoted the event. Joseph Estes, the Chicago City-Wide Coordinator for the Platypus Affiliated Society, said that members of the Platypus Affiliated Society had not been involved in the protest. "We often provide a platform for academics, sectarians, independent intellectuals, and activists. We do not, however, take positions of support with respect to people or organizations that we interact with. Rather, Platypus maintains a critical positions with respect to the Left," Estes wrote in an email. Sainvilus did not immediately respond to a request for comment about why only Diaz was arrested. The Revolutionary Communist Party had a previous run-in with the UCPD on October 7, when protesters stood on an American flag on the quad. A University spokesperson said that the UCPD asked the protester to move so that he would not block the public way. Dining hall protest, arrest, and subsequent complaints about suppression of free speech parallel events sparked by the group at CCNY.